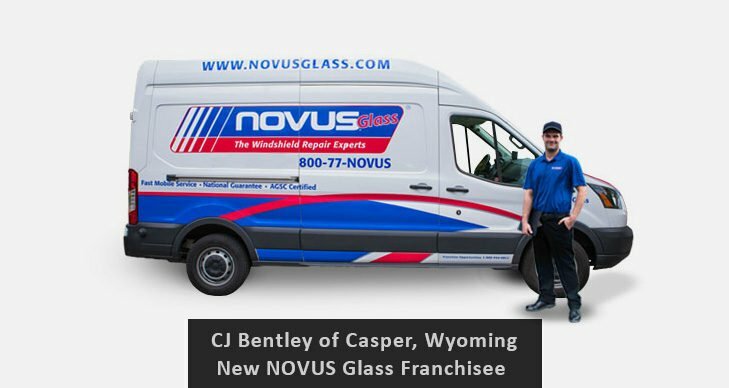 St. Paul, MN – NOVUS Glass continues to expand its Auto Glass Replacement network with the addition of its newest franchisee, CJ Bentley of Casper, Wyoming. A history-filled location, Casper is the second-largest city in the state and played a significant part in the U.S. expansion westward. In the 1800s, hundreds of thousands of pioneers passed through the area via the Oregon, Mormon, California and Pony Express trails, on their way to the west and north.Of course, some travelers stayed in the area and the town at the trail crossroads became a destination of its own. Nicknamed “The Oil City,” Casper had several had refineries since oil was discovered in the late 1800s, and still has a cowboy culture. This picturesque mountain town, a vacation destination for fly-fishing, hiking, biking, and viewing wildlife, has appeal to CJ and his family as all embrace ranch life. CJ and their two sons enjoy roping and are involved in youth rodeo. CJ’s wife, Stephanie, owns a Pilates studio and has been an instructor for 14 years. The couple’s daughter is active in dance. Being apart of their community is important to the Bentley family, and this played a major role in their decision to enhance their city with a NOVUS Window Replacement business. “We did a significant amount of research before we decided on the NOVUS opportunity,” said CJ. “We saw the need for this service in our community and knew that this company provided quality that we could be proud of,” he added. CJ, who was recently the manager of a sign company, has had an extensive career in sales. NOVUS currently has over 2,000 franchise locations and is the international leader in auto glass repair.Potential franchisees do not need experience in auto glass replacement but a history in business and employee managements helpful. With comprehensive, hands-on training, and the reputation as the world leader in auto glass innovation, NOVUS has the ability to help families like the Bentleys build successful businesses. NOVUS invented windshield repair in 1972. For 45 years, NOVUS has been and remains the industry’s research & development pioneer. NOVUS has been awarded more U.S. Patents for windshield repair than the rest of the windshield repair industry combined. For more information visit us at www.novusglass.com or call 1-800-77-NOVUS (800-776-6887) for a NOVUS location near you. For franchise development information, contact 800-944-6811.